Rocky Wood lives in Melbourne, Australia and is the author of major works about Stephen King. Three of these were nominated for the Horror Writers Association’s Bram Stoker Award® for Superior Achievement in Non-Fiction, including Stephen King: The Literary Companion, which won the 2011 Award. He is also the author of two graphic novels, one of which – Witch Hunts: A Graphic History of the Burning Times – was awarded the Bram Stoker Award® for Superior Achievement in a Graphic Novel. A freelance journalist since the 1970s, his articles have been published all over the world, including on subjects such as UFOs, the security industry and popular culture.He served as a Trustee of the Horror Writers Association (HWA) from 2008 to 2010; was elected President of the HWA in 2010, and re-elected in 2012. He is also an Active member of the International Thriller Writers and a founding member of the Australian Horror Writers Association. As a lifelong horror fiction fan, it was great to interview Rocky. It was very generous of him to take the time to be interviewed by Masters of Horror U.K.
Tell us how you came involved in working with the Horror Writers Association. I joined in 2005 after Cemetery Dance acquired my Stephen King: Uncollected, Unpublished for publication. I quickly found the HWA to be a valuable adjunct to my career and their members to be collegial, warm and welcoming people. I have always believed in giving back and have served on the Boards of numerous industry bodies and community groups over 35 years, including in leadership capacities. So I decided to ‘gave back’ by offering to serve on the Board. I was elected to the Board in 2008 and as President in 2010 (and re-elected in 2012). How did you become president of the association? Deborah LeBlanc, my predecessor asked if I would be willing to serve as President when she decided to retire at the end of her second term. I agreed and was the sole nomination! Are you the first person in Australia to be president? Yes, I’m the first Australian to serve. HWA is a truly international organization, with members in Europe, Canada, Japan, Russia, South America and Africa, as well as the United States. How many short stories have you written? One! I have written non-fiction as a freelance journalist since I was 18, and two graphic novels in recent years but I rarely write fiction. This gives me even greater respect for those who do. I read widely as a child and a teenager. I was fascinated by the UFO phenomenon and the theory that this planet has been visited in the past by extraterrestrials. I began writing articles about that and was quickly given a national newspaper column. I also began writing about the security industry, in which I worked. I was inspired by the great nonfiction writers and important nonfiction books such as The Rise and Fall of the Third Reich, The Making of the President 1960 etc. As to fiction I read widely across genres but the three authors I followed closely were Stephen King, Robert Ludlum and James A Michener. 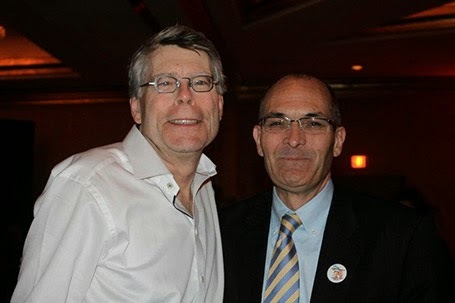 What is it like to collaborate with Stephen King? As you’d expect he is very professional but he also has a great sense of humor and is really easy to work with. King said you know more about his work than he does. Do you have an eye for detail or just a huge fan of his books? Both. In my professional career and in following Steve’s work I am known for my eye for detail. My typed notes, single spaced in 9 font exceed 7000 pages – and as you would expect they are organized and cross referenced. So, while I’m an uber-fan I also have the files and information to give me access to most everything one would want to know. History of Castle Rock? Check. Roland’s eye colour? Check. Roads in and out of Derry? Check? Danny Torrance’s birthdate (check, within a range, as it never specified). What cars characters drive? Check. Businesses in Frazier, New Hampshire? Check. Links between King’s works – check. And on it goes. Do you consider yourself a mentor to other artists? Tell us about your daily (or nightly) working routine. I have specifically mentored a handful of writers, and others in the ‘business’ of writing. But my major way of paying back is to lead the HWA. Each day I deal with my email first (as much of it originates in Europe and the US I generally have a backlog when I wake up). Next, writing to any deadlines – I don’t think I’ve ever missed one and I plan to keep it that way. Next, any general writing or research, depending on which has priority that day. Sometimes, I can’t write much more without research, for instance. Social media gets its turn during down times. I’d say Stephen King: Uncollected, Unpublished and its three subsequent editions. One day, both Steve and I will be gone, but hopefully this book will help inform future readers, researchers and critics much more fully about Steve’s canon than would otherwise have been possible. I am also just finishing a 2014 update to that book that’s going to stretch to about 100 manuscript pages. New information comes to hand constantly as I research, so that book is like a living project. Access to King to clarify obscure questions helps too! Something Wicked This Way Comes (Bradbury), I am Legend (Matheson), The Haunting of Hill House (Jackson), Ghost Story (Straub), The Pine Deep trilogy (Maberry), Swan Song (McCammon). And of course my list of King would be endless, but my top picks from him are The Stand, Bag of Bones, It, The Green Mile, Salem’s Lot, The Shining and The Dead Zone. Horror is the original form of storytelling. As early humans gathered around camp fires on the African savannah, or in European caves surely elders told stories about the dangerous world that surrounded them – full of horrific dangers from wild animals, inexplicable weather events and hostile geography. Today, in the relative safety of modern society, horror stories speak to our most base fears. But they also give us a chance to live out scary and horrific scenarios from the perspective of observer – we can always close the book, or turn off the DVD. Still, many people do suffer horrific episodes in their lives or those of people they know – untimely death, physical, sexual and psychological violence, health issues such as cancer and horror perhaps addresses these issues more fully than any other type of fiction. And, some people just like to be scared! The best horror stories are those with the best writing – a great story, well told, with memorable characters. I suspect many horror readers and viewers are willing to wade through works that are not up to that high standard in search of tales that speak to them, or their fears, directly. My illness now precludes from taking on a book length project. I’ve just completed an article about the influence of the western genre on Stephen King’s fiction. I believe that will be in the January issue of Dark Discoveries. And I’m working on an update to Stephen King: Uncollected, Unpublished. Write every day, knowing that you can improve your writing every single day. Challenge yourself. Read widely. Network, network, network. Believe in yourself while considering advice from mentors and successful writers you would like to emulate. Choose from that advice wisely. Join a local writers group and a national one (or more) that represents your main genre. And, as Stephen King says, adverbs are not your friend! Rocky Wood lives in Melbourne, Australia and is the author of major works about Stephen King. Three of these were nominated for the Horror Writers Association’s Bram Stoker Award® for Superior Achievement in Non-Fiction, including Stephen King: The Literary Companion, which won the 2011 Award. He is also the author of two graphic novels, one of which – Witch Hunts: A Graphic History of the Burning Times – was awarded the Bram Stoker Award® for Superior Achievement in a Graphic Novel. He is President of the Horror Writers Association. David Kempf has written over fifty short stories, many of which deal with themes of horror fiction. He has won several writing awards including first place in the short story competition of Millersville University's Lemuria magazine. Two of his short stories were selected in the 2007 publication of The Grackle, his graduate school's literary magazine. David is featured on two short fiction websites, one American and one British. He holds an M.S. from Chestnut Hill College and a B.A. from Millersville University. David resides in Bucks County, Pennsylvania with his wife and his son. Dark Fiction is his first novel. His latest book The Petsorcist mixes humor and horror.